We love hearing about women supporting women, and the stories shared about overcoming challenging times, leaning on others for support, and finding success through it all. Spacemasks founder, Harriet, shared her personal story and the struggles she faced, all while building the insanely successful Spacemasks company. What was the inspiration behind your company and how did you decide to take the leap of starting your own business? I am totally hyper active and very rarely sit still. The only quiet times I have tend to be in the bath or when I am sitting in traffic. Therefore, I wanted to create something simple, quirky and inexpensive to force us all to switch off, even just for 20 minutes. 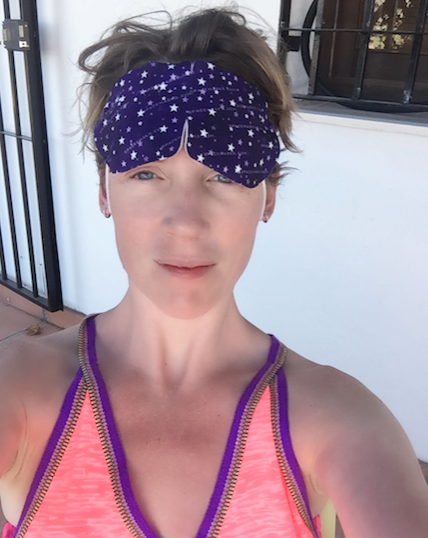 Spacemasks can be taken anywhere, sent to tired friends, used to alleviate headaches and tired eyes and to make us take some much needed time out. Taking the plunge to start up my own business took about 18 months of careful planning and a great deal of mental energy but I knew I had to do it. I often envisage the worse case scenario and work out what to do to overcome it. The worse case scenario of Spacemasks not working would be zillions of Spacemasks to use and gift so not too bad a scenario! There are 3 women who have impacted my life considerably. Elizabeth, who I worked with in restaurant PR for years before I had children, Jo the psychologist I saw when I was 22 and my mother. Elizabeth taught me how to run a small, successful business. Often on paper things sound terrifying and are bound to put any aspiring entrepreneurs off but Elizabeth taught me that through trial and error, honesty and determination, you can achieve most things. Don’t waffle, don’t bulls*it and people will like you. During the time I was working with Elizabeth I lost my mother and suffered from terrible anxiety and depression. I was on antidepressants and had CBT for 2 years. The sessions took place every Wednesday at 8am and they were the highlight of my week. Jo, my psychologist, got me through the very hardest period; one I wouldn’t wish on my worst enemy. She helped me overcome the terrible, pessimistic anxious thoughts that occupied my every waking moment. I was a nervous wreck but she gave me the tools to get through it and it is thanks to her that I am the (possibly irritatingly) positive, perky, chirpy and optimistic person I am today. Lastly, my mother! She had a very strict upbringing, fell in love very young, married and had my brother and me only to be widowed at the age of 36 with zero qualifications and very little money. She got a job, muddled through and was then diagnosed with breast cancer at the age of 41. She never grumbled, she remained entirely optimistic, happy and energetic until her death at 48. She taught me to live each day to its fullest, however cliche that sounds. It is those 3 women that inspire me each and every day.